Sometimes you drink a bottle of wine for the name, the producer, the vintage. But sometimes it's about a memory -- remembering the person that bought the bottle back in the day. This was one of those bottles, with no expectations as to storage or vintage or how it was going to taste. The cork crumbled to tiny bits. I poured the wine through whatever hole I could create in the cork and decanted it through a strainer. 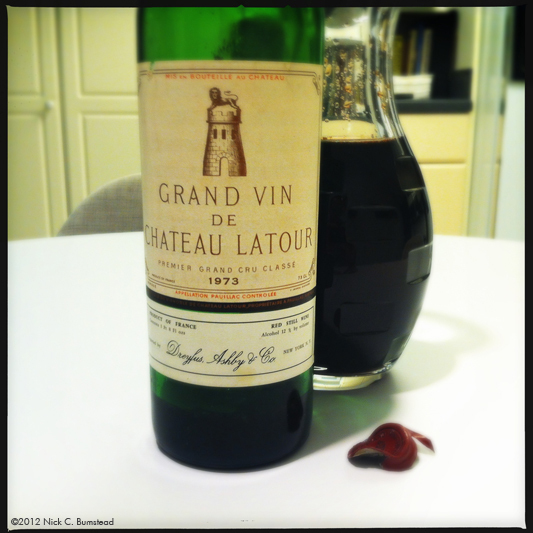 The nose was sublime -- just how you'd expect a Bordeaux from a well-known producer to taste -- cedar, cigar box, woodsy, graphite -- all the classic notes. And it wasn't half bad at all; it had held up well considering what it could have tasted like. And the vintage -- not good at all, which would explain the high acidity and minimal fruit. But it wasn't about the wine. It was about remembering the person that purchased the bottle. Talking about them. Smiling. Reminiscing. Sometimes that's what wine is about.